Discuss your ideas with your partner and check with your teacher. 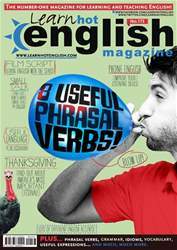 The latest issue of Hot English (173 – the October issue) is out now! Learn over 300 useful words and expressions and improve your listening skills with Learn Hot English! This month: 8 reallyuseful phrasal verbs, 6 expressions for talking about parties, 12 sightseeing words and expressions, 10 useful phrases for making small talk, 12 useful words for the restaurant, 8 “table” idioms, 8 phrasal verbs for talking about relationships... plus: • Psychology – dogs and kids. • Celebrities – names with meaning. • Travel – famous train stations. • Grammar – confusing words. • Phone – leaving a message. • Film scripts – the Godfather. • Holidays – Thanksgiving. • Spelling – “i” before “e”. • TV – Father Ted. • History – stand-still moments. • Cinema – types of film. • Music – misheard lyrics. • Language – a “newbie”. AND LOTS, LOTS MORE! By reading and listening to all this great content, you'll improve your English reading and listening skills and learn up to 300 useful words or expressions. Plus, you'll get a better job and pass English-language exams more easily. Guaranteed!